Organize your TV set in the best manner on this magnificent table. This wood table is versatile and at the same time, an eye-catching home decorative too. This table is rectangular and it is durably crafted. It has mirror work on all sides. The designer mirror drawers compliment the table. 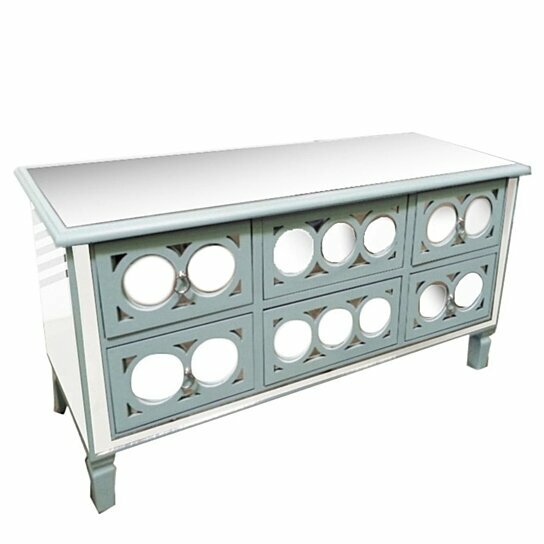 This table with the mirror work and light blue color of it create a wonderful sight. This one is super stylish to be part of any home interior. In addition, it is easy to relocate. No need to assemble as it is a one-piece table. Place it in your drawing room, bedroom or guests room. You can decorate things according to your needs on it. You can keep flower vase or other decorative on the table.